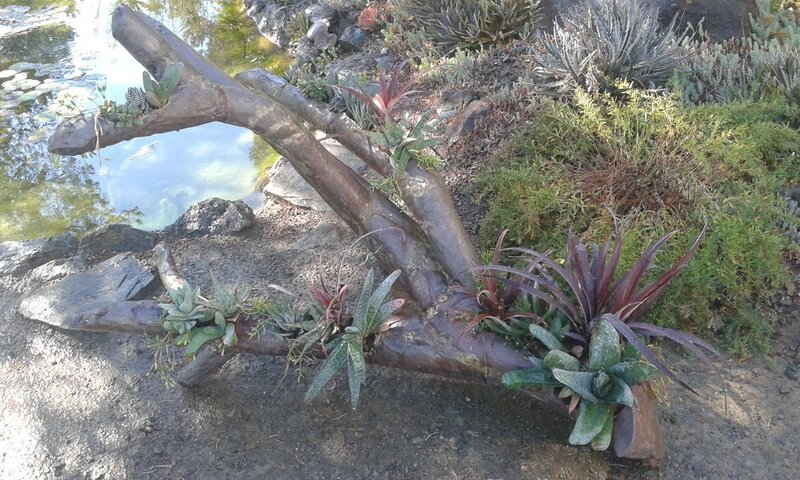 Transforming ordinary every day items into spectacular visual pieces of garden art. Holidays, special occasions, and life events allow for a broad range of styles to be incorporated in container plantings from whimsy to elegance. Succulents have a way of bringing new life to items that would otherwise create cluttered eyesores in our homes or go unnecessarily to a landfill. Both passages, entries and exits, can be made to feel extra special despite the short span of time required to pass through them. "...We really wanted something that would last past the day-of and loved the idea of sharing a piece of our big day with our closest friends and family." Garden vignettes are small areas of a larger garden that provide a single use or multiple functions. A blank wall or a mundane concrete walking surface is easily transformed to become aesthetically pleasing and beautiful with paint. This planting bed was such a small space that multiple drawings from different vantage points were unnecessary. 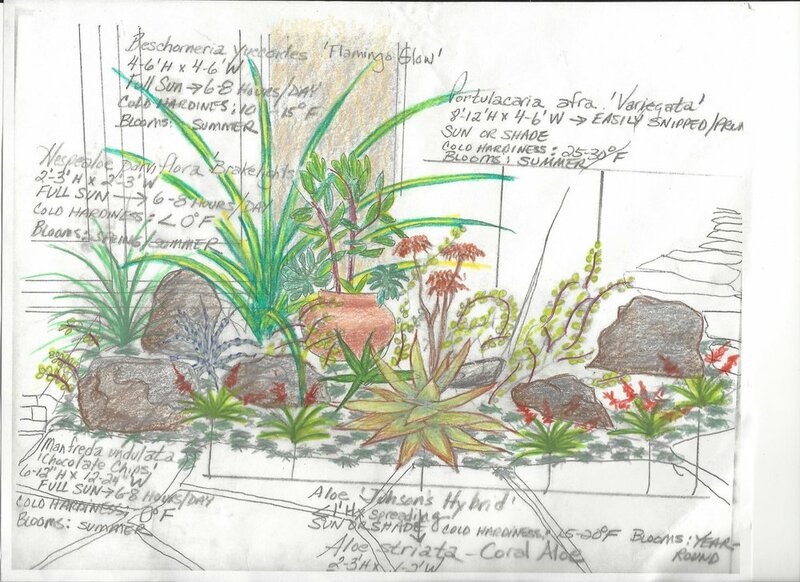 Not every project receives a colored concept drawing but the terra cotta pot was to remain in the composition dictating the need to have the color of the pot repeated throughout the design with the foliage or bloom color of the selected plants. The homeowner for this small planting bed asked for the design to be approached in the same manner that container gardens are approached using the design elements of thriller (tall accent plant), filler (mid-level plants), spiller (plants that are low-growing or spill over the edge). A Beagle resides on this property who has free reign in the backyard running through the planting beds and frequently takes naps in them. This required the selection of plants that were not prone to snapping when brushed against, or that contained spines or toxic sap. Traditional landscape design services offer a landscape plan to the homeowner, which shows a birds-eye view of the property identifying structures and hardscape in outline form and plants in varying sizes of circles. I approach the process by supplying the client with a plant list and then take photos of the areas needing new plantings. Next, I print the photos in black and white on 8 1/2" x 11" paper, place tracing paper over the printed photos and draw in the existing elements such as fencing or mature trees that will remain on site. Then I execute drawings from different vantage points, if necessary, showing the new plants in their mature sizes in the suggested placement. This allows the homeowner the ability to see what the plants will look like a few years after installation, as if they were standing there in the future. 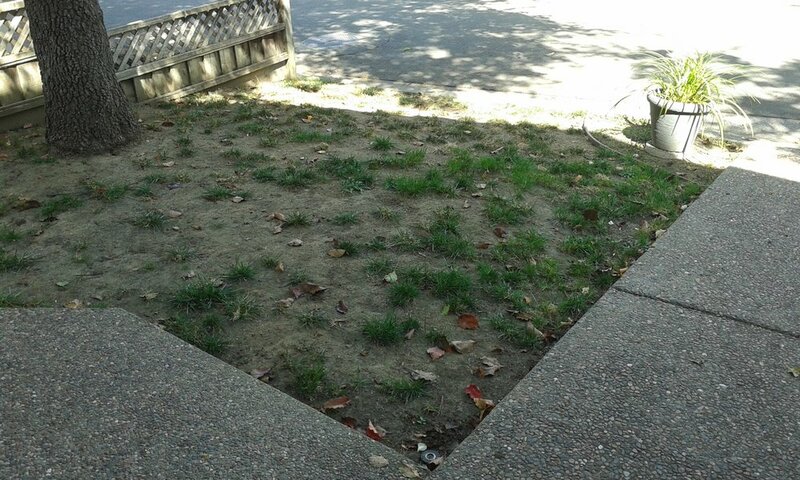 This Walnut Creek townhouse with a north-facing sloped front yard was planted with turf and had two issues contributing to the failing health of the lawn. The area did not receive enough hours of direct sunlight to keep the lawn lush and the slope caused irregular irrigation. The spotty remnants of turf were removed and aggregate stepping stones, matching the existing hard surfaces, were installed to form a walkway from the front porch to the street. This new walkway would be used often to access a car that the residents frequently parked at the curb. The homeowner desired a new landscape to flank the driveway that would be low maintenance and thrive in the mostly shaded environment. 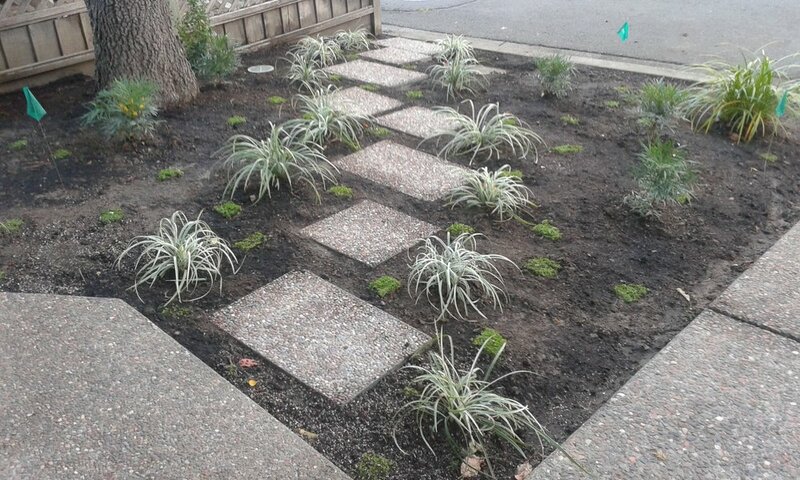 The newly installed stepping stones were bordered with Liriope spicata 'Silver Dragon' to highlight the path. Taller shrubs were installed in front of the wood fence that when mature will provide some fragrance such as Sarcococca ruscifolia and Daphne odora 'Aureo-marginata'. Both of these shrubs are slow growing and stay at 3'-5' in height preventing the need to prune any time in the near future. A third shrub, Mahonia eurybracteata 'Soft Caress', was planted throughout to provide a different texture that does not exceed a mature height of 3-3 1/2 feet tall. 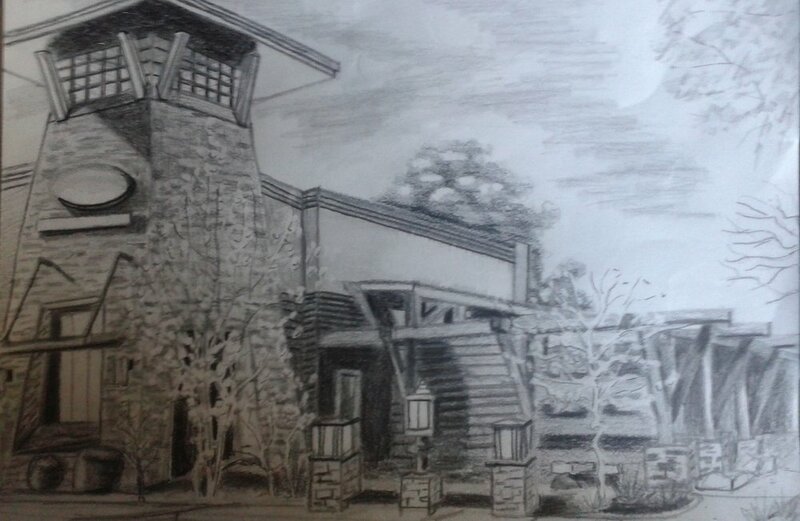 Linnea is exactly what I was looking for in a landscape designer! She considered all of the site requirements and my desire for a low-maintenance landscape design, gave me lots of options, and based on my preferences came up with a dynamic design including plants with varying height, color, and foliage. I appreciate Linnea's artful approach to landscape design. Her plans are presented like pieces of art while being easy to understand and follow. Garden vignettes are small areas of a larger garden that provide a single use or multiple functions, be it sipping a beverage and reading a book, critter or people watching, depending on the location of the vignette - front, side or back yard - enjoying a view or taking a nap. If all else fails, take a nap! The homeowner of this side yard gated entrance endeavored to create a benched seating area opposite the succulent planted garage windowbox. This enabled her to enjoy a beverage and a beautiful view while waiting for guests to arrive. Beyond the bench, visitors pass through an ivy covered metal arch to gain access to the backyard. The above two photos show the gradual transformation of the entrance to a hillside garden from July to November. This area was the first sight upon cresting the stairs to a wood deck at the base of several terraces. Prior to the month of July it was a catch-all or a dumping ground for scrap wood, tools, disorganized toys, numerous objects and refuse. By simply removing the jumbled items and slowly relocating metal signs lying in a pile on the ground, metal garden art, and other miscellaneous elements with story-telling potential, garden visitors are now greeted with a scene that puts smiles on their faces. The former planting of azaleas in this small space underneath the open riser concrete staircase, shown on the right in the first photo above, were removed. The azaleas were unable to produce abundant blooms in the low light conditions. The homeowners decided to dress up the area using giant clam shells and succulents that would survive in low light conditions such as Gasteria, Sansevieria, Haworthia, and Aloe hybrids. The above photos were taken on a rainy day. On a sunny day the area will receive brighter light due to the open riser staircase but never any direct sunlight. The first photo shows the clam shells oriented on the diagonal with the hinged side forward-facing. The second photo shows the clam shells still oriented on the diagonal but turned to highlight the fluted edges. Positioning them in this manner will allow the Senecio rowleyanus, commonly known as String of Pearls, to cascade to the ground. The third and fourth photos were taken after the rock top dressing and existing clay soil were removed. The area was filled with fast draining soil with a high mineral content, crucial for the health of succulents. The first photo above shows the start of the new fast draining soil being delivered. The second photo shows the space filled with the new soil, the clam shells in their final position and the first in-ground plant installed in the back corner, Sansevieria trifasciata 'Singer's Silver'. The third photo shows a fallen tree limb set in place to add height and interest to the installation. The fourth photo shows all in-ground plants installed and the clam shells planted. The photo on the left above shows the final plant installation with Spanish Moss added to the cut ends on the smaller branches of the tree limb. The photo on the right above shows the finished installation with the rock top dressing back in place and the entire space lighted for nighttime drama. Thank you so much for our lovely new garden. We truly are enjoying our new outlook when leaving the house. The light at night adds a lot too. Getting lots of compliments on the garden. Transitional spaces such as passing through a gate or arch, when designed in a welcoming manner, can have a powerful effect on our psyche. Both passages, entries and exits, can be made to feel extra special despite the short span of time required for us to pass through them. Elements of wonder, delight and surprise can be utilized to increase our enjoyment of these transitional spaces making us feel transported to another time and place. Double Threshold Side Yard Entry. There are two thresholds located at this gated entrance. The wood lattice gate serves as the first threshold which has been complimented with a flagstone path, succulent plantings to the left and an elegant concealed trash bin enclosure to the right. Immediately beyond the trash enclosure is a cedar bench and table giving the homeowner a place of rest and reflection. The metal arch creates a second transition through the space as visitors enter the back yard patio containing two seating areas. Many of the projects illustrated on this page show the transformation of objects in our lives that have outlived their original design purposes. Succulents have a way of bringing new life to items that would otherwise create cluttered eyesores in our homes or go unnecessarily to a landfill. 1947-1954 Chevy Grill with a new life! Da da! Here it is, in all its succulent glory. This old painted copper mailbox was replaced with a new solid copper mailbox and was given a new life filled with succulents. New Life bursting with succulents! The old mailbox is currently displayed on the ground next to the new mailbox with a cheery new message. This approximately 100 year old family heirloom was given a new face lift. This was achieved by sealing the wood handle and planting the metal bucket with a mix of succulent and non-succulent plants that would echo the color of the enamel. This poolside planted pot went from sad to spectacular in its full sun exposure. This was achieved by replacing the tired Chrysanthemum with a variety of sun-loving succulents pulled from multiple containers scattered around the property that had no visual appeal on their own. Now the pot shouts with glee to “Look at Me!”. The owner of this ceramic Jack-O-Lantern asked to have her container filled with a wild and crazy planting of succulents. Succulents in warm autumnal tones of deep gold, orange, rust and brown were paired with the gray-green of the Aloe plicatilis and dried plant material. Screening was used inside far enough behind the eyes and nose to keep the planting a sufficient distance back so that a battery operated candle could be placed inside, allowing the arrangement to serve as a luminary. The Clown Shoe was a solid gray concrete planter. Nothing special to look at. The owner asked to have it painted to look like a clown shoe. The popcorn bucket was added to the arrangement to complete a circus theme and planted with a sedum suggesting the bucket was filled and overflowing with buttered popcorn. This repurposed metal mailbox was replaced with a solid copper vintage mailbox. The owner chose to not send the old mailbox to the landfill and asked to have it planted. It now resides on the ground near the base of the mailbox post, creating a playful nod to its new use in its retirement. This Weber Grill was replaced with a newer model by the griller extraordinaire. 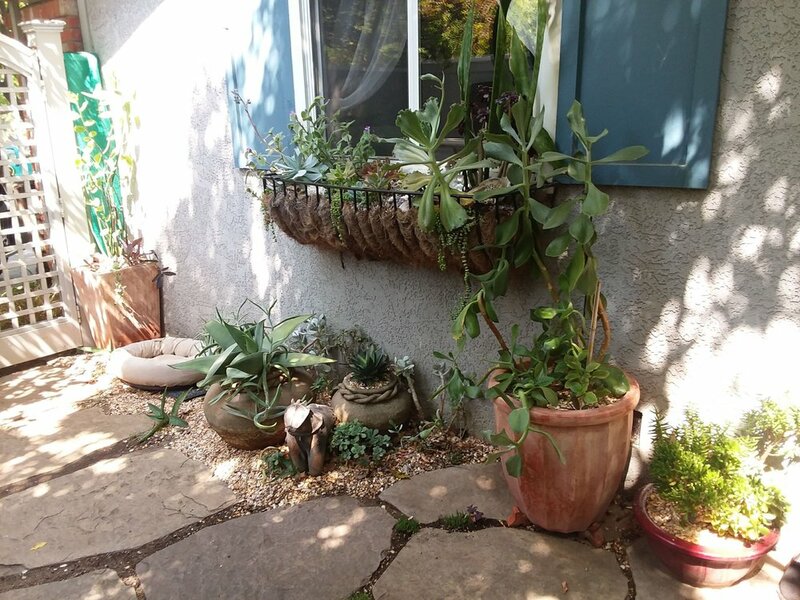 He gifted the retired grill to be transformed into a planter filled with succulents suggesting that something edible was actually being grilled. This was represented by five Echeveria ‘Black Night’ reminiscent of beef patties, Crassula ‘Campfire’ mimicking flames, the orange-red flowering Delosperma suggesting flying embers and red lava rock giving the impression of burning hot charcoal briquettes. "Linnea is a succulent genius! My husband and I met with her to create living succulent arrangements to be used as the centerpieces for our wedding. We really wanted something that would last past the day-of and loved the idea of sharing a piece of our big day with our closest friends and family. We had purchased 6 stone containers that we liked the color and style of since they were low and round but essentially left everything else to Linnea - and we were not disappointed. She really blew us away with her expertise and her attention to detail. You can tell that Linnea has a great eye for color and design because she put these together so meticulously, we honestly wouldn’t change a single thing. We came to see the progress about a month before and we were so pleased that we asked if she could create another piece from a teapot and creamer we had to tie in our tea theme and head our sweetheart table. They looked so incredibly adorable and whimsical and everyone loved this detail that meant so much to us. The centerpieces looked simply stunning on each table that evening and really pulled the whole thing together. Better yet, our guests loved that they had a beautiful living arrangement to grow in their garden as a memory of this day - and I’m glad we kept one too because it is so lovely to look at and reminds us of the best day of our lives. Thank you, Linnea!" 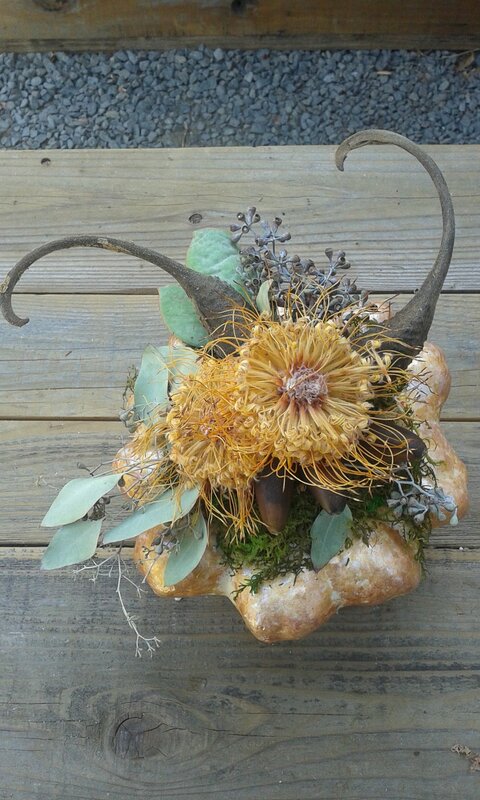 These squash were sponge painted with metallic acrylic paints prior to being adorned with green moss, succulent cuttings, dried plant material, seed pods, acorns and more. 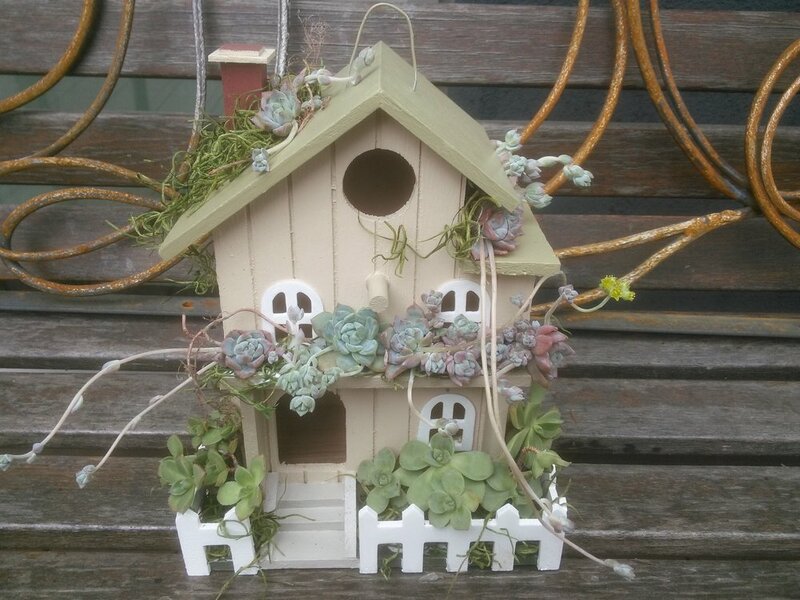 The following images are of store bought wood birdhouses that were hand-painted and then decorated with succulent cuttings. They are placed in the Floral Design section because their decorative purpose is shorter lived than succulent dish gardens. The succulent cuttings are glued in place and can be removed at the time when they show signs of desiccation and/or etiolation. 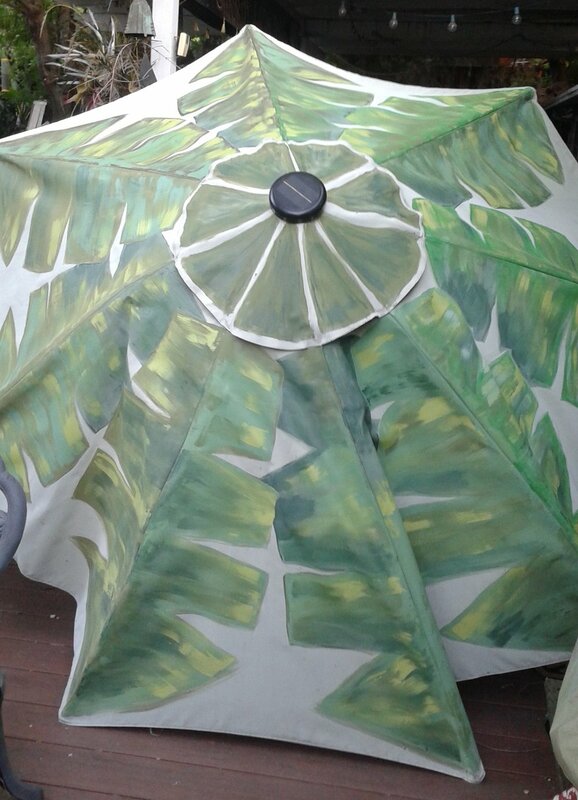 Items on this page demonstrate my painting skills and ability to transform ordinary every day items into spectacular visual pieces of garden art such as concrete stepping stones, concrete landscape blocks, walkways, patios, fences and any surface that will accept paint. A progression of Day of The Dead Catrina wall planter can be found in the Themed Container Plantings section. The original unit was one color throughout - the brownish olive of the man-made composite. Her transformation included the painting of her face in addition to holes being drilled into the sides of her head. This enabled the plantings to resemble a headdress framing her face. The final five in all their glory! They rest on top of the gravel to the left of the front entry for all guests to enjoy. The homeowner of this backyard concrete patio could not tolerate plain gray concrete and had a strong aversion to having real flagstone installed knowing that debris would constantly collect in the mortared joints. 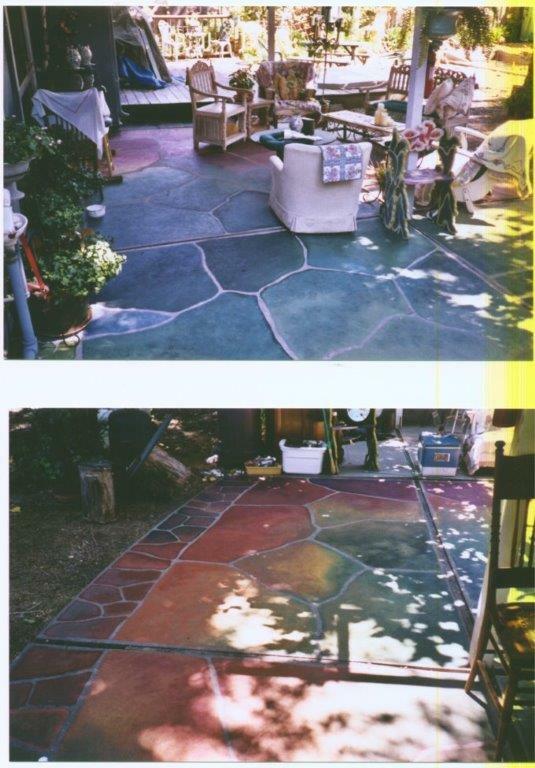 The homeowner was also interested in having a very multi-colored surface that would be impossible to achieve with stone. The surface is flush, collecting no debris, and includes almost every color of the rainbow with the exception of pink and purple. Murals are powerful additions to almost any indoor or outdoor space. They can trick or fool the eye into perceiving a more expansive view beyond the actual boundaries of the area. Techniques such as trompe l'oeil or "illusion painting" are used to create this optical illusion of depth. These tools of visual deception can not only provide spatial illusion but also tactile and textural impressions using realistic imagery applied in extremely fine detail. Murals can also simply be ornamental or decorative in function by the use of patterns or two-dimensional renderings rather than 3D. There are many reasons to incorporate one or more custom hand-painted signs into the décor of a once-in-a-lifetime event or cyclical events. They have the power to imbue a special quality to the festivities; they can blend in with existing themes to provide cohesiveness and continuity; they have the ability to be fashioned in unusual shapes and non-standard sizes; and they add striking, eye-catching imagery that is impossible to go unnoticed. The Landscape Horticulture Department at Merritt College in Oakland needed a highly visible event parking sign. A portion of the department logo was used to maintain identity and high contrast colors were applied to stand out. The sign was hand painted using acrylics and then sealed with an exterior sealer. Letter stencils were intentionally not used in an attempt to promote a hand crafted look. A soil science instructor, during one of her lectures, expressed the desire to have a poster-sized version of the above pH (potenz Hydrogen, a phrase meaning the “power of hydrogen” or the “potential of hydrogen”) scale. The above image is painted onto a 32" x 40" sheet of mat board. The scale is on the wall of the classroom as a teaching tool to show students how soil pH affects the nutrient availability and form, which is vital to plants. Do you have a special event requiring a colorful painting of the guest of honor's name? Or any other message you would like to convey in a bold manner? This name sign was painted with acrylics in a freehand style without the use of a preliminary sketch or line drawing. A grandmother asked to have a sign painted to hang on the gate of the corner of her yard that she fenced off for her granddaughter. The sign is the first phase of a two phase project. The second phase will be to paint a mural using some of the images from the sign onto one of the wood perimeter fences. Griller extraordinaire with award-winning chicken recipe, placing first three times at the Martinez King of the County BBQ Challenge, needed a logo for his competition booth. The rampant lion with the title of the barbeque team was painted using acrylics onto a stretched 20" x 24" canvas. That design was hand-painted onto three T-shirts and three aprons for each of the BBQ team members. Next, the logo was deconstructed into two separate components. The title of the team was hand-painted onto two 12"H x 10'L canvas banners and the rampant lion was hand-painted onto four canvas panels that were attached to the ends of the banners. Smokin’ LION BBQ in action at the Martinez King of the County BBQ Challenge. Placed FIRST for Best Booth Design in 2011 competition.